Lutz, when he was with GM. 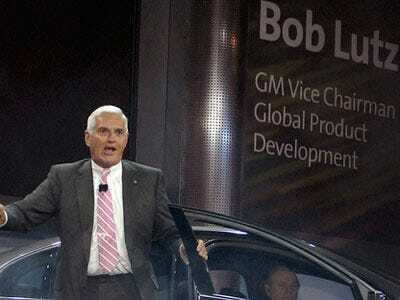 Bob Lutz is a legend in the auto industry. He worked at BMW and also for Lee Iaccoca, the guy who saw Chrysler through a major crisis in the late 1970s (Lutz arrived in the 1980s). A former Marine, he flies fighter jets and isn’t afraid to speak his mind. He finished up his career at General Motors as the “product czar,” trying to inject some emotion into a company that’s often been better known for a corporate culture that prefers to count beans. His publisher recently brought out the paperback edition of his book, “Icons and Idiots: Straight Talk on Leadership.” Business Insider ran an except, and I talked with Lutz about a wide variety of topics at the time of publication. 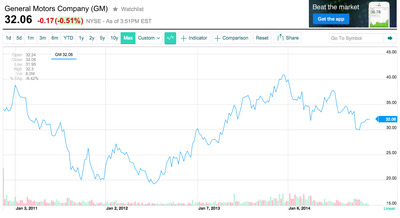 Among them was the strange performance of GM’s stock. Since the company’s emergence from bankruptcy and $US20-billion IPO in 2010, shares have been flat when they haven’t been down. The stock really cratered in mid-2012 before ascending to around $US40 in late 2013. But since then the trend has been down. Down. And more down. These days, shares are trading around $US30. But many Wall Street analysts dislike the stock. And Lutz thinks he knows why. Wall Street likes volatility, and GM isn’t a company that’s designed to deliver it, either in the markets or the marketplace. The company controls about 20% of the U. market for cars and trucks, pretty much divides the highly profitable full-size pickup truck segment with Ford, and continues to have a very broad portfolio of vehicles — something for just about everybody. The company is good at making cars. Through its finance arm, GM Financial, it’s also good at lending people money to buy those cars. What it isn’t good at is posting double-digit growth rates for its valuation. And this is the nature of the business. It’s not like GM is going to suddenly go from 20% US market share to 30% market share. Chrysler would have to disappear to even set up such a possibility. For GM, the game is to retain existing customers, “conquest” a certain percentage of customers from other automakers every year, and pursue growth in China, its best foreign market. GM does pay a nearly 4% dividend, so beleaguered holders of the stock are at least being paid for their trouble. But having watched the company closely since before the bankruptcy, it’s far from clear to me that GM stock is ever going to start pushing toward new highs (I don’t own any, by the way). Actually, the business doesn’t really seem optimised to do that. This is a disconnect one just has to get used to.